Sunday is Sept 1st. In many people's minds after the summer, this date is a parallel to the New Year. We are returning to work, school, family realities in our day to day routines and hopefully our church roles. One way to convert that hope into action is for us to put pen to paper or keyboard to tablet, laptop etc and intentionally plan your time and tasks for ministry. I personally work from the premise that "IF YOU DON'T, YOU WON'T". If you visit my office at CEM you will see my walls are papered with a huge map of Ontario and numerous 3M poster sheets with my job priorities and a breakdown of the specific tasks to actualize those goals. If you visit me I will walk you through the outcomes I envision. I want to partner with each of you in the accomplishment of lofty goals, yours and mine. If you want to know what mine are email me at kerry@communityofchrist.ca and I will email you photos of those sheets. My goals can't be realized without engaging you. I have already made several calls to church participants and shared my hopes for now and how we can work together. We are a team! I invite you to both envision and write out your own life stretching goals. Even if you can do no more this very moment, and I mean now, than write a heading on a piece of paper and place it where you can't miss it, that says, "Mission - My Bucket List Goals" in large letters so you can begin your draft a little later, without fail! Remember "IF YOU DON'T, YOU WON'T". What motivates you, to give you a reason to participate? That's what you really want on your Mission bucket list. Sure there are things you can put on the list you think a church going person might do, but the big question is ........ is that going to motivate you, provide meaning for you, connect you with those you would dearly like to be on a bucket list adventure with? We are limited only by ourselves. How many of us watch less than 12 hours a week of TV ....probably not many. You may be surprised to know that when you miss a season of Survivor or Mike Holmes or Leafs or Jays, life goes on through life-changing bucket list empowerment choices you would have never otherwise known. I would not be writing this blog now if I had watched the Jays lose 7-2 to the Yankees tonight! I want to be a catalyst in your lives. In our consumer driven, entertainment driven, somewhat self-absorbed lives (I have been and am there often) it is difficult to be in Mission, to envision and execute bucket list goals with the limitless distractions about us. So.....Sept 1st.....Do It! Partner with and be a catalyst for another, to challenge one another, affirm one another, succeed with one another. You create the plan, make it yours and live it! If you have a desire but aren't quite sure how to go about it, email me and expect your life to get recharged! 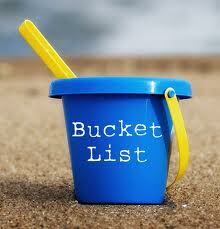 You're on my bucket list.....one by one! A new small group? Details, man, details!!! I'm interested - you hooked me - now reel me in!! Have a great day, Kerry - I really enjoy reading your "Good Words"! Susan I am delighted to have had 3 requests today. I will look up your contact info and we can work out the process. Sounds like Ken's fishing is rubbing off on you. I commend you for taking this step.